Living on campus is more than just going to class, grabbing food at the dining hall and spending countless hours doing homework in the library. UNH offers dozens of non-academic activities for you to take part in. There are more than 200 different student organizations so there should be plenty of options to fit your interests. And if you can’t find one that you’re interested in, don’t worry! You can easily start your own club. The place to begin is the MUB. 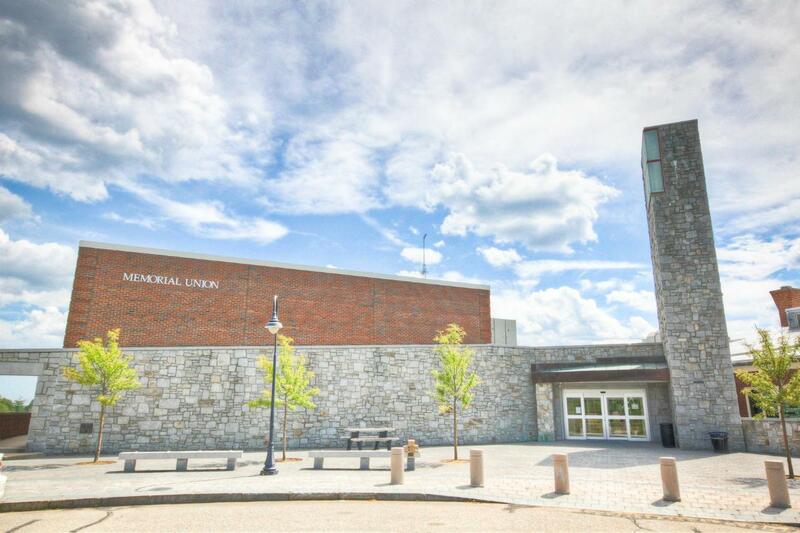 The MUB, or the Memorial Union Building, is the center of campus life at UNH. Here, you can find something to do any day of the week as well as check your mail, get your computer repaired, buy your textbooks or grab a snack. The school year kicks off with the Office of Student Involvement and Leadership (OSIL) hosting Jukebox. This celebration of the new school year is primarily for first-year students and gives them the chance to see what UNH has to offer while picking up some free stuff. While at Jukebox, you can talk with current students about their clubs and find out how you can get involved. The majority of student organizations meet in the MUB once a week so always feel free to stop by a meeting. Check WildcatLink for more information. You should also check out the Guide to Getting Involved at UNH. The MUB offers more than just student orgs. Sometimes involvement is just about taking advantage of all that is being offered. And there is a lot. For starters, every Thursday – Sunday, the MUB and MUSO (Memorial Union Student Organization) show two movies (and sometimes more) in its two movie theaters. You can always find what’s playing and when on the MUB website and the UNH Mobile App. The MUB also features two large function spaces, the Granite State Room (GSR) and Strafford Room, where you can see comedians brought in by CAB (the Campus Activities Board) or lectures on any number of topics. Some other great events are Thursday Night Bingo (every third Thursday), Stress Relief (end of every semester) and the Grind (on the first Friday of every month). These free events are put on by CAB. MUSO also hosts a number of free concerts throughout the year. Campus Recreation offers great options on and off campus for both the athletically-inclined and those just looking to have a good time. The Hamel Rec Center, which, at the time of publishing, is undergoing an expansion and renovation, offers something for everyone. The Rec Center is open 6 a.m. – 12 a.m., Monday – Friday, 10 a.m. – 10 p.m. on Saturdays, and 10 a.m. – 12 a.m. on Sundays. As of April 2016, you’ll find a three lane suspended indoor track, the fitness center with more than a hundred different cardio and work out machines, a squash court, racquetball courts, classrooms, a rock climbing wall, two studio fitness rooms and more. Did we mention the five basketball/volleyball courts? Also, keep in mind that with your student ID you can borrow equipment to use on the courts. As part of the expansion, Hamel will be getting a new wellness space and instructional kitchen, larger fitness spaces and more. You can read all about it here. If you’re looking for a fun way to work out with others, look no further than the group exercise calendar. Campus Rec offers numerous options for group exercise classes during the semester, ranging from aquacise/water fitness to Zumba and everything in between. There are classes for the early riser as well as the evening gym-goer. You can even get certified to be a group fitness instructor and teach classes yourself. Make sure to check their website to see the updated schedule each semester. Interested in hitting the ice at the Whitt? Campus Rec gives you a chance during open ice hours each week. These times are set aside so that you can skate or play a pick-up game during Stick and Puck time (note: the free skate and pick-up games never happen at the same time). Don’t have your own skates? Don’t worry! For $3 you can rent a pair of skates. If you are looking for some adventure in your life, Campus Rec has you covered with Outdoor Adventures. Throughout the semester, they offer trips and other activities such as rock climbing, surfing, hiking and more. Some trips cost money but they are well worth it. All equipment is provided so don’t let not owning a surf board or rock climbing gear keep you from trying something new. Learn more about Outdoor Adventures here. Want to play a sport? Campus Rec offers two options for you: intramurals and clubs. Intramurals are popular across campus with dorms creating teams to compete in tournaments and leagues each semester. Choose from any number of sports including basketball, hockey, broomball, floor hockey, inner tube water polo and more. There is something for everyone when it comes to intramural sports. You can find out more here. The other option is joining a sports club. Much like intramurals, there are a variety of options including hockey, baseball, archery, judo, dance, ultimate frisbee and much more. Find out more about club sports here. Now, no four years of college is complete without joining your fellow students in cheering on the Wildcats. Some of the most popular sports are men’s hockey, football, men’s basketball and volleyball. When you choose to go to one of these games, or any of the other sporting events on campus, know that you’re in for a lot of fun — win or lose. There are some traditions at our sporting events to be aware of. Many of our sporting traditions are only for men’s hockey games but they are ones that bring us together. First, you have the fish. Yes, the fish. If you haven’t heard of this tradition, you’re in for quite the show. After UNH scores its first goal, someone throws a large, stinky fish over the boards and onto the ice. Whoever goes out to retrieve the fish so the game can resume is usually wearing a bright yellow hazmat suit. That’s how bad that fish is. But the crowd loves it. Another athletics tradition is White Out the Whitt. During the home game of the UNH vs UMaine series every year, students wear white to, you guessed it, White Out the Whitt. This is also the game where students will get in line at 4 a.m. the day tickets become available and will be in line all day to get the best seats. If you are interested in what else happens at UNH athletic events, the Cat Pack is the next important thing to know about. At almost all sporting events on campus there is a student section known as the Cat Pack. These are the seats for you and your fellow Wildcats to enjoy the game and participate in cheers and chants led by the Cat Pack captains. This is our school spirit student organization and the group that leads all of the chants. If you don’t know what you are supposed to be doing at a certain point in the game, just look to them. Join this student org and be a part of making the athletic experience even better for fans at the games. Finally, even though you live on campus, it’s important to know about public transport options that help you get around campus and let you explore New Hampshire, Maine and Massachusetts. One of the things that you’ll notice is that UNH is very walkable. You can get to practically everywhere in about ten minutes or less. Whether you are walking from Fairchild and Hetzel Halls to the Whitt (10 minutes, 0.5 miles) or from Williamson and Christensen Halls to Cowell Stadium for the big game (15 minutes), you can get anywhere without the help of the bus. That doesn’t mean you can’t use it though! Wildcat Transit is a great resource. It gets cold living in New Hampshire and many students will take advantage of the campus connector buses to get to and from class during colder weather. Wildcat Transit can also take you off campus to the surrounding towns of Dover, Newmarket, Newington, Portsmouth, and Rochester. The four off-campus routes (Route 3 – Dover, Route 4 – Newington/Portsmouth, Route 5 – Newmarket, Route 125x – Rochester) are all free with your student ID. You can find out where the bus is in real time or just check the schedule using the UNH mobile app. Next to the Whitt at the Dairy Bar is our own station stop for the Amtrak Downeaster. If you’re looking to get off campus and head to a city, this is your best option. The Downeaster stops at Boston’s North Station and Woburn/Anderson and Haverhill, Massachusetts; Durham and Dover; and Wells, Saco, Old Orchard Beach, Portland, Freeport and Brunswick, Maine. With all of these options and a reasonable price, you can plan a nice adventure off campus or, for those who are coming from other states in New England, you have another way to get home. All of these aspects of campus life are just a snapshot of what it is like to live and play in Wildcat Country. Once you’re here you’ll see the full scope of everything campus has to offer.